Christine Marie Renhard Stenstrom was born in Bremerton, Washington, in 1946 and raised in the Pacific Northwest. She attended Mountlake Terrace High School in Mountlake Terrace, Washington, and graduated from Cascade High School, Everett, Washington, in 1964. Christine’s collegiate education began in 1964 at Grays Harbor College, Aberdeen, Washington, in 1964-65, where she was a member of Phi Theta Kappa Honorary. She continued her college studies at the University of Washington, Seattle, graduating in 1969 with a BA in sociology, a minor in history, and a secondary teaching certificate. 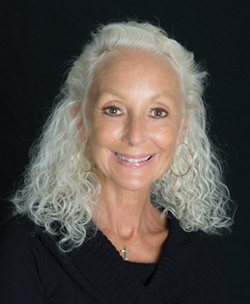 Christine attended Northern Illinois University, DeKalb, Illinois, graduate studies in special education in 1977. Her graduate paper, “The Impact of Law and Litigation on Special Education,” was circulated among special interests groups. Since 1972 Christine developed her own unique style of artworks. Her watercolors and pastels are characterized by intense color and boldness and each artwork is dramatic in presentation with her contemporary style of applying watercolors and pastels. Her creative writing evolved since 1991 after Christine designed her first Christmas card with both her artwork and her prose. She continues to be challenged in combining both her artwork and prose whereby one is the reflection of the other. The reader is both visually and literally inspired by her unique presentations. In 2004, Christine composed her work into manuscript form which continued to evolve until it was published in 2010. Christine’s inspiration for her artwork, writings, and life in general is Thanks be to Jesus from whom all blessings flow. As a mother Christine was involved with her daughters activities. Christine chaired art enrichments programs in her daughters schools in Bellevue, Washington, Bloomfield Hills, Michigan, and Radnor, Pennsylvania. She and her husband Dennis supported Erika and Britt in tennis competition with the United States Tennis Association Junior Tennis tournaments both regionally and nationally. In addition, Christine served on numerous national tournaments in Detroit and San Diego donating her time and artworks. At one time Christine taught tennis to youths in the areas of Chicago and Bellevue, Washington. Christine resides in Poway, California, with her husband Dennis, a retired intellectual property attorney from Hewlett Packard. Together as a family they have lived in Seattle, Chicago, Detroit, Philadelphia, and San Diego.